Sometimes, you have a special bottle of wine you want to drink, and that dictates what you're having for dinner that night. Other times, you know what you want to eat, and will go out and get a bottle of wine even if you have a cellar full in order to feed the need. Yesterday I knew that before the sun had set I was going to have an ample plate of linguine alle vongole. I wanted to think I was by the sea, with the saline tang of the air in my nose and the taste of fresh seafood on my lips, perhaps because after several days of warm summery weather we are back to rain and sweaters (I know no one outside LA thinks this is a particularly dramatic weather tale). And I was alone for the evening, so I could do exactly as I pleased in the food and wine department. So I went out and bought some beautiful Manila clams from Whole Foods--or Whole Paycheck as it is known in our house and many other houses-- and set them in a bowl of water so they could spit out any last sand they had carried with them from the ocean. While they sat, I put a pot of water on to boil. Once you let the clams soak for 30 minutes or so, and the water's ready, you're only about 7 minutes (including such onerous prep chores as mincing garlic and chopping parsley) from the meal itself. I made my linguine alle vongole from Nigella Lawson's recipe in Feast, but it's not online and Tyler Florence's is, so here's a link. (For what it's worth, the idea of topping it with breadcrumbs is awful, so I'd skip that "option" if I were you.) Ms. Lawson includes this wine in her section dedicated to dinners for one--which she says are the most important meals of all to make and revel in. So, no drinking wine from a box or poking through my limited collection of half bottles of wine for me tonight! I was going to celebrate dining solo and open a bottle of muscadet from the Loire coast to go with my linguine. I'm not sure why I thought this pairing would work, but I think it had something to do with my conviction that Loire whites often have a nice, mineral tang that would go well with my clams. 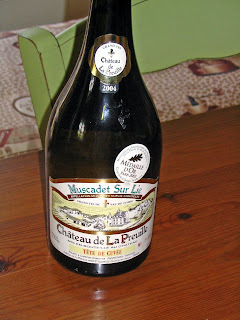 The 2004 Chateau de la Preuille Muscadet des Coteaux de la Loire ($13.95, Chronicle Wine Cellar; also available at Terranova and WineSellar.com for around $20) hails from the Nantais wine region which borders the Loire as it approaches the sea. Made from melon de bourgogne grapes (also known as muscadet) it was aged in barrels with the remnants of the yeasty lees left over from fermentation. This aging method makes the wine more complex and rich. It's bright gilt color conjures up images of sun and sand and the golden flesh of Anjou pears. Once you sip this, your immediate first impression is of a round and dry white, with pronounced mineral aromas and light whiffs of citrus and pear. As the flavors develop in your mouth, the citrus and pear take over, moving the mineral notes to the background for a juicy finish. This would be a nice change of pace for folks who like unoaked chardonnay, with its interesting minerality and round, full feeling. This wine represented good QPR and certainly will encourage me to try some more muscadet from the Loire. And it was darn good with my linguine. One of the things I like most about wine is the way that it can transport you to different times and different places. Drinking my Spanish wine the other night, I could almost feel that I was sitting under one of those Spanish windmills, hearing the creak of the blades as they turned in the wind. With my clams and Loire white I found myself dining alone in some imaginary Franco-Italian seaside. This was definitely a "sur lie" wine. Will keep my eye out for Pepiere and Papin, but as with most French wines the pickins are slim on this coast. Will especially check K&L who has more French wine than most. Thanks for the rec!